We culled news stories about the discovery of the 9,000 year-old skeleton in Washington State, and wrote an article for Science Communication. Erin received an Oregon Humanities Chautauqua award and toured the state, lecturing about the controversy. I went to the Smithsonian to learn more about the perspectives from the Indian experts and from non-Indian experts. After the skeleton was discovered, Indian tribes wanted the bones returned for burial, but anthropologists argued they should be able to study Kennewick Man. The conflict resulted in a long legal battle, with the federal judge allowing scientists to study the bones. The ensuing news coverage is riveting. News coverage of science often takes a discovery arc, which is a grand narrative in Western writing. The story mirrors the narrative of Columbus’ journey, which I still recall vividly from grade-school. I just never understood that if Indians were already here, how could we be discovered? During my fellowship at the Smithsonian I spent several hours at the Museum of Natural History in rapt attention at the Written in Bone exhibit. The exhibit is vibrant, full of sounds, lights, cameras and action, and is structured to invite visitors to be crime fighters, like CSI investigators solving a mystery. You get pulled into the exhibit, where you see how bones reveal secrets about the dead: what the dead pioneer ate, how she worked and how she played. Bones become the keys to discovery. But if you walk across the National Mall to the Museum of the American Indian, the narrative changes. The bells and whistles of the Written in Bone exhibit give way to a calm ambiance. The Museum exterior reflects the earth, rivers and sky, and the interior feels like a longhouse, greeting you like an old friend. You won’t find a theme of discovery. This Museum weaves the historic with the modern, where you can see how Native science emerged from an understanding of the stars to the contemporary art by Brian Jungen. Jungen is a master of intertextuality, where he combines the traditional with the modern in whimsical ways. If you squint, you can see a landscape of totem poles in the distance. But as you get closer, the effigies give way to luggage. The artist fashions Indian objects from plastic and metal. There’s a woman’s dance shawl that looks like it’s been woven from basketball jerseys. And then there’s a skull. The skull is housed in a glass case. You can walk around and get a full view. But it’s not like the bones across the Mall. 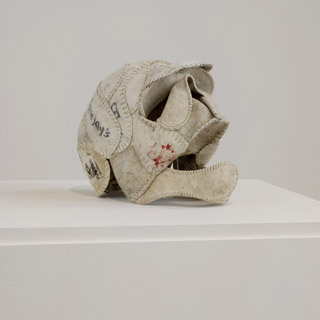 The artist has created a human skull from old baseballs. Do bones constitute a sport? This entry was posted in authenticity, Indian, journalism, Kennewick Man, NAGPRA, Native Science, news bias, repatriation, science and tagged literacy, native science. Bookmark the permalink.